Note that Merom will operate in the very same power envelope as Yonah does, meaning that power consumption will stay constant while performance goes up. This also makes it easier for OEMs to simply start shipping their existing Core Duo designs with Merom instead of Yonah, avoiding a lengthy and costly ramp up of Merom just months after Yonah really started shipping in volume. 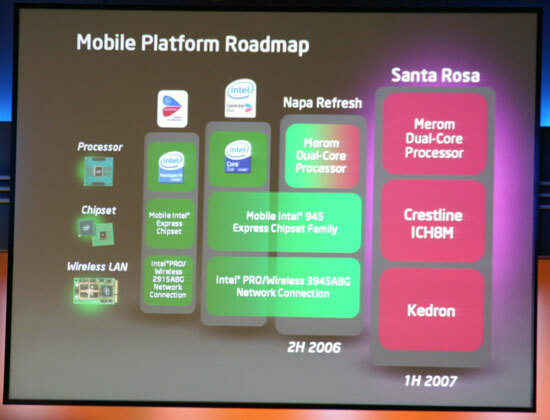 In 2007 Intel will replace Napa with the Santa Rosa platform, also featuring Merom but with a new chipset (Crestline and ICH8M) as well as a new wireless solution called Kedron. Merom will be given a faster FSB on the Santa Rosa platform (most likely 800MHz or 1066MHz), but will otherwise remain unchanged from what launches later this year. 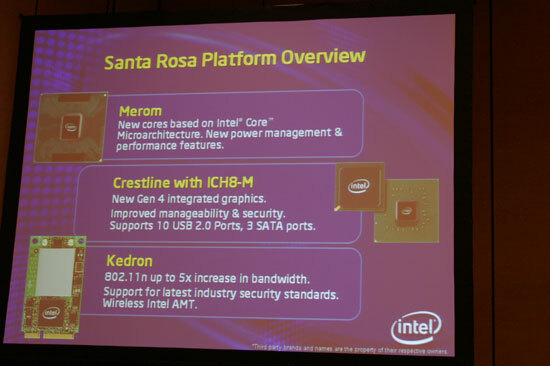 The Crestline chipset will include the next generation of Intel's integrated graphics. The new ICH8M will feature 10 USB 2.0 ports and 3 SATA ports. On the wireless side, Kedron will support 802.11n as well as 802.11b/g. 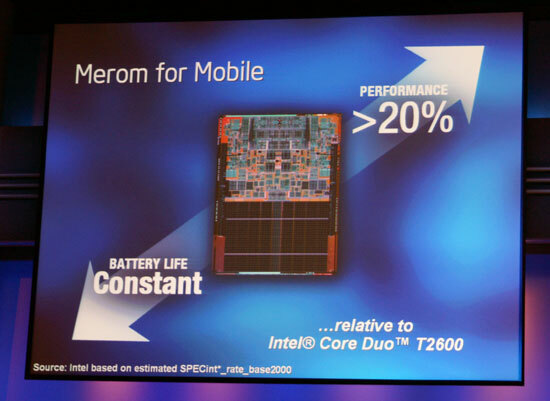 Earlier today Justin Rattner mentioned that Merom platforms would offer more than a 20% increase in performance relative to the current Core Duo T2600 (2.16GHz) processors with no impact on power consumption. During a separate briefing, Intel's Mooly Eden showed a benchmark pitting a Dell Core Duo system against the same system with a Merom processor (Eden literally swapped out the Core Duo CPU and stuck in a Merom processor, partly to showcase its backwards comptability). The benchmark was a custom Quake 4 timedemo, with the Core Duo system scoring 106.6 fps while the Merom system scored 134 fps: advantage Merom by just over 25%. We don't know any of the specifics of the settings on the systems, other than they were claimed to be identical. Given the results we've seen with Conroe on the desktop, this sort of a performance increase does not seem out of the ordinary.